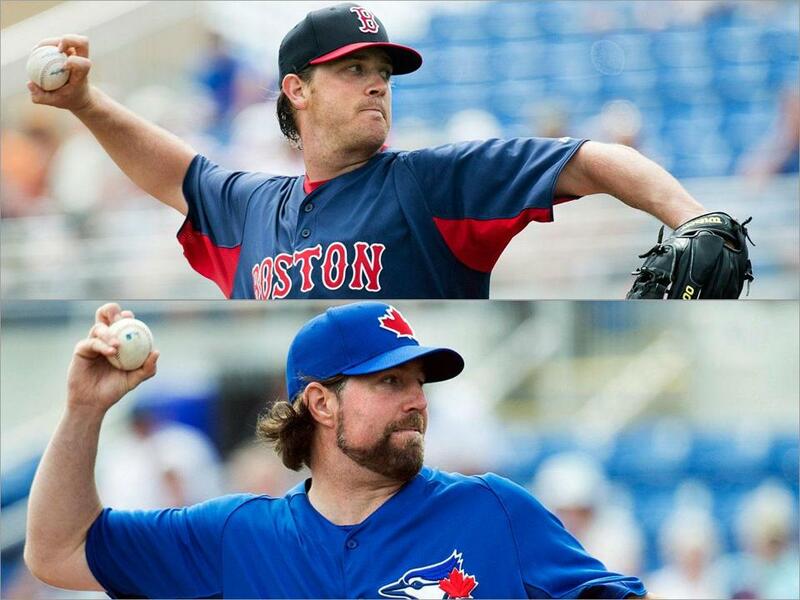 A gripping drama: knuckleballers Steven Wright (top) and R.A. Dickey face off. DUNEDIN, Fla. — Steven Wright is 28 years old and this is the first season he has been invited to major league spring training. So his start for the Red Sox Monday was an important milestone. Then the knuckleball pitcher learned a few days ago he would be facing R.A. Dickey, the reigning National League Cy Young Award winner and one of his mentors. The Red Sox also asked retired knuckleball maestro Tim Wakefield to watch the game from the stands behind the plate and offer Wright a few tips. It’s rare to see one knuckleballer at the park. There were three at inelegantly named Florida Auto Exchange Stadium. “Today was a good day just for the game itself,” Sox manager John Farrell said. Wright threw two scoreless innings in a 4-2 victory for the Sox. He struck out three and added to the organization’s belief that he can help the major league team this season. Wright had a 2.44 earned run average and averaged 7.6 strikeouts per nine innings in Double A last season. The Red Sox obtained him from the Cleveland Indians in July. Professional scouting director Jared Porter identified Wright as a pitcher who could fill different roles once he polished his command of the knuckleball, much like Wakefield did. Assistant general manager Mike Hazen, who sat in the stands with Porter and Wakefield, said the Red Sox are open-minded about the knuckleball and willing to give Wright time to develop. “It makes me feel like I need to work even harder. With the resources they’re giving me, I’m going to take full advantage of using them,” said Wright, who as a conventional pitcher was on the verge of being released by the Indians before he tried the knuckleball in 2011 and committed to it last season. Wright throws the knuckleball hard, much like Dickey does. Wakefield threw the pitch slower during his 19-year career, but he can offer advice about mechanics and subtle adjustments. After watching Wright warm up Monday, Wakefield suggested he move a little to the first base side of the rubber. That would line up his arm with the middle of the plate. Wakefield also had Wright lead more with his front foot to maintain better balance. “Those two small adjustments I felt made a huge impact on my feel for the pitch and I was able to keep it in the strike zone,” Wright said. Wright allowed a one-out double by Melky Cabrera in the first inning. But he retired Jose Bautista on a fly to center and Edwin Encarnacion on a one-hopper back to the mound. Wright struck out J.P. Arencibia and Brett Lawrie swinging in the second inning. Colby Rasmus singled, but Wright struck out Moises Sierra. The ball got away from catcher Jarrod Saltalamacchia after Sierra swung. But Saltalamacchia, who caught Wakefield in 2011 before he retired, was quick to retrieve it and throw the runner out. Wakefield will report to Red Sox camp Wednesday to work more with Wright. One of the lessons will be about how to change speeds with the pitch. Wright still occasionally throws a four-seam fastball. But a second knuckleball he could use as a changeup would add much to his arsenal. Until Monday, Wright and Wakefield had spoken only on the phone. When Wright was in the Cleveland organization last season, former Red Sox coach Rob Leary connected the two. Wright is likely to start the season in the rotation at Triple A Pawtucket. If he can show the ability to throw strikes with the knuckleball while behind in the count and reasonably control the running game, he would be in line for a promotion if a need arises. “I hope so. That’s the goal. I want to go out there and compete. If I get the opportunity I want to take advantage of it,” Wright said. Dickey allowed two runs on four hits in his two innings. Brock Holt, Jackie Bradley Jr., and Saltalamacchia had singles to score the first run. Bradley then scored on a wild pitch. Dickey liked what he saw of Wright, saying he has a bright future in the fraternity of knuckleballers. “I’m pulling for him, of course, because I’ve walked a mile in his shoes and I certainly have empathy as far as what it takes to endure that pitch and that’s what you’ve got to do with it, is endure it until you get to the other side,” he said. Wakefield hopes to see a time when a knuckleball pitcher comes out of the high school or college ranks and climbs to the majors. Most knuckleballers started out as conventional pitchers who turned to the pitch when their careers began to fade.